One of the most common questions we get from people is "Will you be at X event?" Unfortunately, our answer is often 'no' because of the logistics involved in having our team at the event, getting the event to pay for the expenses, communicating with their vendors and performers and all the rest. 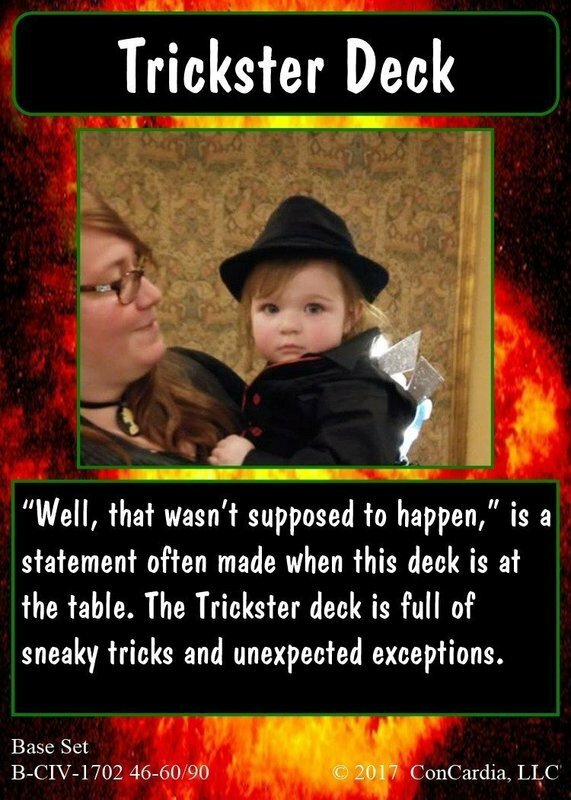 However, we have also heard from many of the performers and vendors who do have cards that they take their leftovers out to other events and give them out to great acclaim. Many say that they use their cards as business cards. We would like to encourage this behavior, so we are introducing ConCardia Direct. 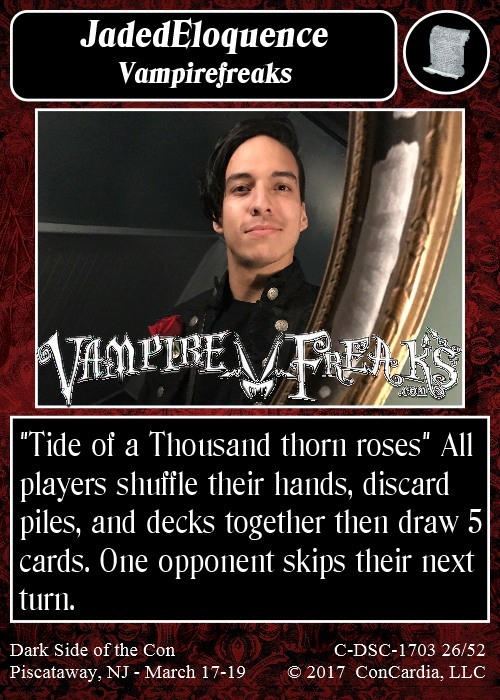 You can now order your own custom card to give out at cons, use as a business card, share with your friends or do whatever else your little heart desires. 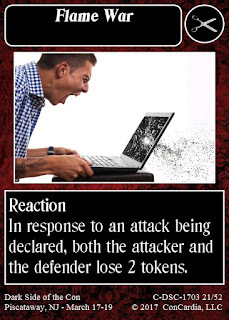 For just $30, you will get 60 copies of your custom card. You can get additional copies of your card at a rate of $10 per 60 additional cards. Perhaps you don't just want an average power card. Fortunately for you, we can be bought! Want your card to be more powerful than the average card? That can be arranged for an extra $20. Want your card to be super powerful? That can be done for an additional $40. Want your card to be game-breakingly good? We can be convinced to do that for $100. To order a card, visit the order form here. If you aren't 100% sure what you want your card to do, that's ok! We'll send you a proof before we send it to the printers. What ConCardia at your convention? There's now three ways to do it. With the advent of a variety of 60 card decks, players may wish to have a good way to buy one deck and divide it among a group. Below are rules you could use for a draft. They are not official rules that must be followed, but a guideline that your group can adapt to their own needs. This procedure could be used for either V3 or V4 rules, but it will work especially well with the new Version 4 rules. The point is that it be fair and everyone have fun. Beyond that, there's no wrong way to draft. Randomize the cards to be drafted. 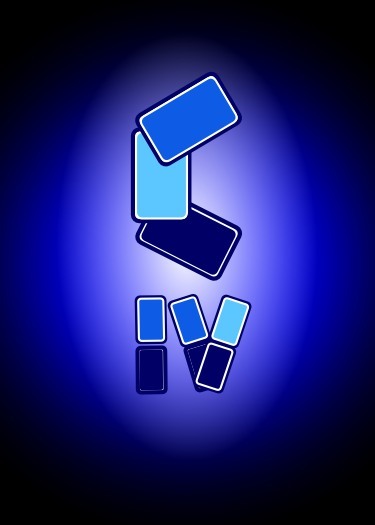 Divide the deck evenly among the player, then divide each of those stacks into three stacks. Each player picks up the first stack and selects one card before passing the stack to the left. Repeat until the first stack has been distributed, then repeat step 3 with the second stack, but this time pass to the right. The 3rd stack is passed to the left again. Players build decks from the cards selected. If each player has less than 20 cards, then they may build a deck as small as 13 cards, rather than the usual 20. A group may choose to maintain a communal collection and simply draft each time they play to create a more dynamic card environment, or the draft can be used a divvy up a new set of cards that was acquired. There are a number of industries in which the greatest competition that a professional faces is not other professionals but the erroneous belief that people can do it themselves just as well. Photographers, web designers, and event planners know well what I am talking about. 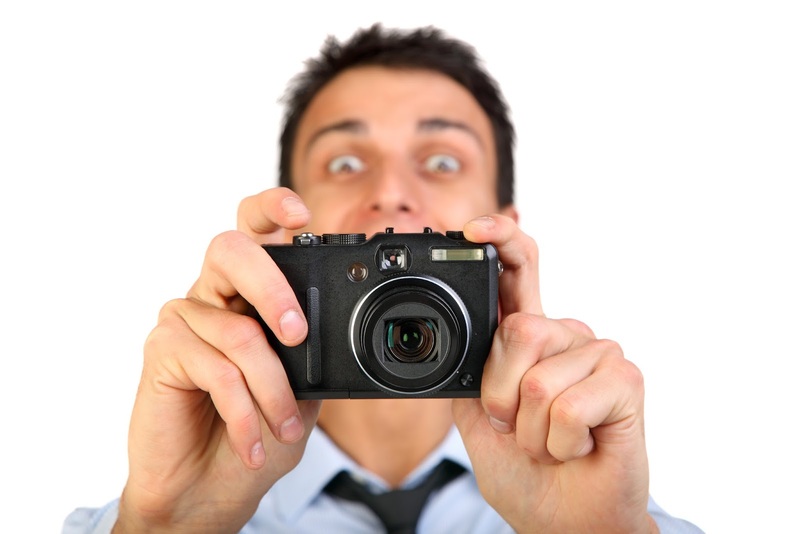 People who would never dream of doing their own taxes or repairing their own cars, believe that they create professional looking web sites or take great photographs... or make effective event vendor traffic programs. As someone who has been designing programs to promote vendors at events for half a decade, I too see the misguided efforts of event organizers to throw together some kind of program to push traffic to preferred vendors. A couple weeks ago, I attended a business expo. It ran for one afternoon, and was otherwise very well organized. There was a fantastic array of businesses to interact with. So many, in fact, that one could not possibly have time to talk to them all. An ideal venue for a scavenger hunt to drive traffic to sponsors and preferred vendors. First, finding the businesses would require a participant to take about half an hour of their precious time at the event to sit down with the riddles and the very long vendor list to figure out which ones to visit. Anyone who was serious about making contacts would consider this a waste of time, and likely anyone who was willing to prioritize this puzzle over visiting vendors is less likely to be the kind of person that the vendor was hoping to meet. They're going to see someone. Will they see you? Second, there was no way to verify the signatures that the participants got on the card. A participant could very easily fake a few signatures and claim the prize without visiting the vendors. Otherwise, the expo was a fantastic event, and I'm sure that the people who came up with this riddle scavenger hunt were very smart people, but they lacked experience in producing this kind of program. With 5 years of experience developing vendor hunts just like this, ConCardia would have been a perfect solution to their need to promote vendors. It could even have been done in a way that would create no expense for the event organizer. If you are running an event (or know someone who is), don't reinvent the wheel. Bring in the experts. ConCardia has been helping people find their way to the best* vendors at an event for half a decade. We can help them find the best vendors at your event too. Contact us at info@concardiagame.com for more information. Have you experienced these kinds of activities that were meant to be fun but somehow felt more like homework? Tell us about them in the comments! *We are a little biased in thinking that any vendor who chooses to have a ConCardia card is the best. The new ConCardia store is now up! You can now order the 6 original pre-constructed decks through the store, and if you order all 6, you'll get an extra bonus copy of one random deck. The store will be the place to get a wide variety of pre-constructed and licensed decks. A licensed deck is one that features some other group such as a band, movie, author, or even a community group. Any organization or even a person an get a licensed deck made. We are excited to announce that ConCardia has been invited to Lunacon, one of the oldest and most respected scifi conventions in America. The event is April 7-9, 2017 in Tarrytown, NY. More details at their web site. And most of them will have ConCardia cards to give out. 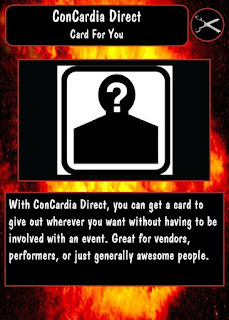 If you are interested in having a card at Lunacon, email info@concardiagame.com. The New C4 Rules are Here! Every one loves ConCardia, but the rules are a bit dense. Thousands have collected cards but less than a hundred actually played the card game. This tells us that it's time for a simpler card game. You asked, and we provided. Multiplayer, playable in 15 minutes, learnable in moments, C4 is a whole new rules set that will change the way you game! 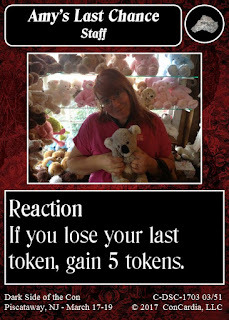 Well, at least change the way you play ConCardia cards. 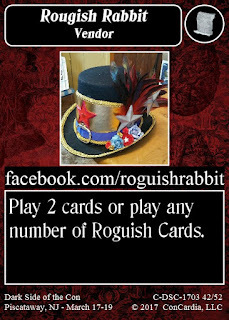 We have a playtest set of the rules available for download here. 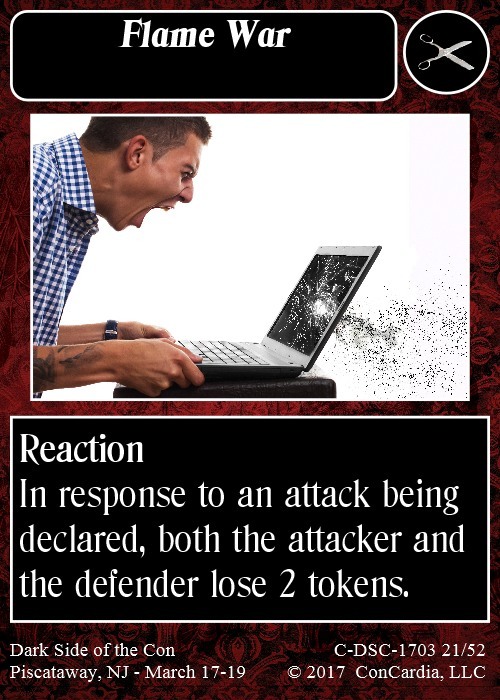 Print out a deck for each player, and give it a try. We will be premiering the first convention set at Dark Side of the Con, March 17-19, but before that we are producing four preconstructed decks of 15 cards each to teach people to play and use as starters. ConCardia is a new kind of game, unlike any other. Instead of buying it in a store, you collect it at an event! At a ConCardia event, players visit the ConCardia table, get the starter set of cards and a rules explanation if needed. They then adventure around the convention, seeking out vendors, performers, and others with cards to give them. Cards could be anywhere! The cards are built into a deck and used to compete against other players in tournaments at the event. For more information, click on one of the tabs above. If you would like to contact the great makers of ConCardia, you can email us at info@concardiagame.com. Sign up for our email list by clicking here!